Amid the many catastrophes of the twentieth century, the Spanish Civil War continues to exert a particular fascination among history buffs and the lay-reader alike. This Very Short Introduction integrates the political, social and cultural history of the Spanish Civil War. It sets out the domestic and international context of the war for a general readership. In addition to tracing the course of war, the book locates the war’s origins in the cumulative social and cultural anxieties provoked by a process of rapid, uneven and accelerating modernism taking place all over Europe. This shared context is key to the continued sense of the war’s importance. The book also examines the myriad of political polemics to which the war has given rise, as well as all of the latest historical debates. It assesses the impact of the war on Spain’s transition to democracy and on the country’s contemporary political culture. 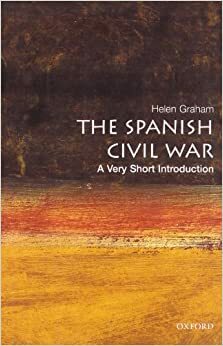 The Oxford University Press has a series of short introductions to a vast array of subjects, and the Spanish Civil War version has been put together by Helen Graham, a professor at Royal Halloway, University of London. Putting together a short book on a massive subject would be no easy task. But when Paul Preston hails a book as ‘far and away the best short introduction to the Spanish Civil War’, the praise doesn’t get any higher. If a reader wished to start learning about the war, reaching for a hefty Preston, Thomas, or Beevor tome could be daunting, and the subject can drive even the most knowledgeable person to distraction. A Very Short Introduction is cut into seven sections. The book lays out the foundation in a short slice, no easy task, and dedicates a chapter to the early days of the war, explaining the reality of executions on both sides of the conflict and the vigilante-style operations Spain was running in the quest for power and freedom. The book manages to cover Franco’s rise to prominence through a combination of will and luck, as well as how Spain was won through the help of Hitler and Mussolini. With all these aspects, and the huge array of groups pushing their own agendas, the war is impossible to simplify, yet the book gives the initial details without overwhelming readers. A Very Short Introduction lays out the people, the major events, the reality of Spain at the time, everything needed to help a newbie understand why Spain collapsed the way it did in 1936. This book is written in a simple style, without a strong voice but rather an academic view of the facts. This book has drawn criticism, especially from being marked as biased (which I dared to read), and, 1 ) being unbiased about a Spanish Civil War is nigh impossible, and 2 ) those decrying the book as biased and rabidly left-wing seem to be free and easy with the facts themselves. The book may not jump up and down with a passion, and that is not its purpose; it is a clear and simplified version a horrendously difficult subject, and perfect for its initial goal. A Very Short Introduction was promised and delivered.